Walnut jardiniere plant stand, 19th. > ANTIQUE FURNITURE>Walnut jardiniere plant stand, 19th. 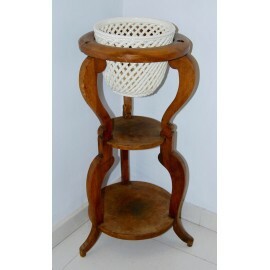 Walnut jardiniere plant stand from the late 19th, the first with white ceramic pot. MEASURES: 72 cm. height - 33 cm. of diameter at its widest point. Antiques walnut jardiniere plant stand from the late nineteenth century, three shelf, the first with white ceramic pot, robust structure and well preserved.